Dead And Beyond (Ancient Legends #4) by Jayde Scott. Publication : February 25th 2012 by CreateSpace. I have to start by thanking Cami from Reading Addiction Blog Tours and also Jayde Scott for offering up this review copy. It's really appreciated guys! Let me begin with this - I try not to review a book if I haven't read the previous ones in the series but since this is a blog tour, I didn't have that choice. I'm going to refrain myself from having a strong opinion about this one because like I said, I haven't read the previous books and to be quite honest, I wasn't sure about all the characters or what was going on with them at first and it's my fault for not looking it up. 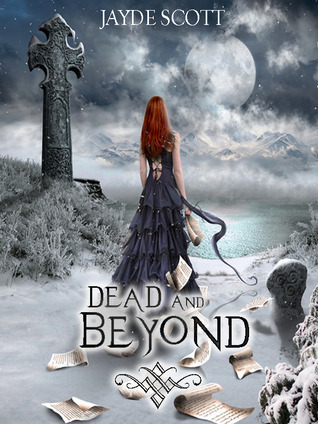 Dead and Beyond is the fourth book the Ancient Legends Series. I have to give the author points for her recap because although I couldn't get into the story completely, it was enough to keep me interested. This is the story of Amber, a vampire newly turned by her super hot vampire boyfriend, Aidan. Amber has some special abilities - she's a necromancer and can see dead people. There's a mystery element to the story that involves Amber having to find one of her friends who is missing and also a ghost that's haunting her. The plot's pretty standard for a paranormal story, nothing exceptional but still enjoyable. I've read a book by Jayde Scott before, it was a little close to chick lit and I wasn't keen on the book's plot but I still knew right away that I could relate to Scott's writing style. The same thing goes for Dead and Beyond, Jayde Scott has a clear voice and a knack for creating likable characters. Amber's POV was amusing and pretty entertaining! Aidan and Amber's romance takes on a cliche route at first, with all the secrets. I never get why most books have the boyfriend/girlfriend hiding things from each other when they're supposed to be deep in love. Well, at least Amber redeemed herself later and they were actually quite cute. Aidan might actually be someone I'd have a book crush on if I had read the series from the beginning. I'm just not really attached to any of the characters right now, though I'm not sure if it's because I don't know enough about their background or something else. If you're a fan of the traditional vampire/paranormal stories, you would definitely enjoy this. Although I wasn't left with a lasting impression, that's probably only because I'm not emotionally invested in the characters. Don't get me wrong, this is an enjoyable read and there're definitely some ultra-romantic moments and quote worthy lines. Scott's writing is witty and engaging. If you're looking for a quick paranormal book/series that you can count on to 'like', this is one of those. This is the 4th book of a series ?? Great now what I'm going to do!